Wendy's 3-D Cats: DOMINO: PURRPLE MAJESTY! Here's a hatted picture of Domino from the summer of 2015. She always looked fabulous in PURRple, but then she looked fabulous in just about any colour. 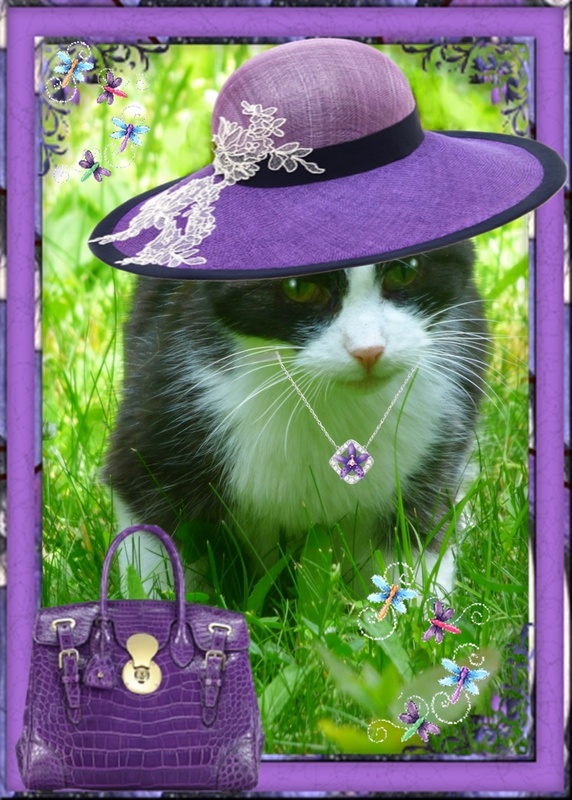 Her wide-brimmed woven deep PURRple hat with ivory floral embellishment sets off her natural complexion (i.e., her fur coat). And what a beautiful silver necklace with PURRple flower pendant she is wearing! Finally, she chose a PURRple bag made of alligator leather with gold latch and strap fasteners. It all gives me butterflies!